Yoga is the holistic practice that works wonders on the mental as well as the physical aspects of the body. Strength and flexibility are the core aspects of yoga asanas. Holding a yoga posture helps in strengthening various muscles and joints in the body. This posture strengthens the abdominal muscles and if done at a faster pace it will aid in belly fat reduction. - Stand erect with your spine straight. Inhale while you raise your hands and exhale while you bend forward. - Try to bring your forehead to the knees and let your hands touch the floor or be under your toes. You can also hold your ankles. - Stay in this position for a few seconds. The Cobra pose will give a good backward bend to your spine which is highly important in relieving back pain and in strengthening your back. - Lie on your abdomen with your chin stretched forward. - Place your palms on the floor, making sure that they are in line with your shoulders. Inhale while raising your head, chest and lower abdomen. - Make sure your big toes are touching each other while performing this asana. - Hold the posture upto three minutes. 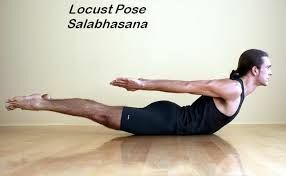 Salabhasana helps in relieving tension from your back and thighs, thereby strengthening the back and the core to a significant level. - Place your palms parallel to your shoulders and raise your hips slightly. - Inhale while raising both your legs up. - Repeat this posture for about 5 to 10 times. This posture is great for the core muscles and is good for increasing flexibility. - Stand straight with your legs wide and bring your palms together. - Inhale while raising your hands and exhale while bringing your hands down. Place your palms in between your legs and look back through the legs. You can interlock your fingers on your back. - Do this up to 20 times for effectiveness of the posture. The dolphin pose is often done as a preparatory exercise for performing headstands. It is very effective for strengthening the arms. - Sit on your heels with your spine straightened. - Bring your hands forward while placing your elbow on the floor, come to mountain position i.e. an inverted V.
- Stay in that position and exhale while bringing your head forward without touching the ground. Inhale while going back to the mountain posture. - Continue this process for about 15 counts. Yoga is not only beneficial for mental health but is equally effective when it comes to building physical strength. Do consult a yoga instructor before practicing the asanas to ensure your safety and effectiveness during the practice. About The Author: In 2013, Sarvesh Shashi started Zorba, India’s Happiest Chain of Yoga studios and went on to become and was labeled India’s Youngest CEO in the Health and Wellness Sector by Bloomberg. He is a great believer and encourager of sports and has had the chance to travel with a few IPL teams for 3 years, which strengthened his inclination towards sports.